"One of my favorite parts about the new Mac App Store is that it is "buy one, run everywhere" just like iOS apps on the iPad or iPhone/iPod touch. It has always been the case that you can buy an app at the iOS App Store and use it on all of your iOS devices." This is great, and makes me want to purchase my apps from the app store even more. I wonder, though, if this will be true of all apps. It is true in the iOS ecosystem, but that doesn't mean developers will be happy about this, especially if they already offer family packs. I wonder if developers can choose to shut this off or if it's all part of the agreement they have with Apple. As it stands, it's great for consumers. Obviously, all of those machines must be using the same App Store account for this to work. 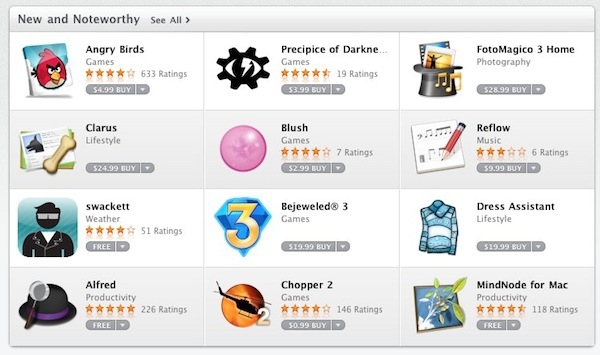 Will this encourage you to purchase applications for OS X from the App Store?